The Hulk attacks the Thing on a rooftop. Ben Grimm refuses to fight the gamma powered creature. Suddenly, the green hero explains that he doesn't want to fight and wants Ben's help. A confused Thing agrees and they leave to Vermont in a Fantasticar. Once there, the Hulk points out the body of a Celestial to Ben! Back in New York City's fashion district, Steve Rogers and Rich Rider are searching for a tie. Steve feels he needs Sue Storm's advice on a proper one. Rich points out that he's been talking about Sue a lot lately. Both are slightly embarrassed by the statement so Nova changes the subject. Richard asks Captain America if he's noticed the growing number of anti-Thor demonstrations. They seem to be angry over Thor's diplomatic immunity status. Before they can discuss the issue, a mugger races past them out of the subway followed by a police officer! The criminal turns and hits the officer to the ground. Suddenly, a woman standing by slams her elbow into the thief's face and knocks him out! She turns to Steve and is overwhelmed to recognize him as Captain America. She tells him that he is the reason she began volunteer work. The woman introduces herself as Martine Glines and asks him out to lunch. Back in Vermont, the Invisible Woman joins the two strong men. 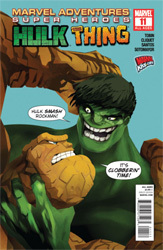 Sue and Ben stand back as the Hulk uses his immense strength to remove the boulders from the Celestial. Nearby the Hulk's foe, The Leader, watches. Meanwhile in New York, Steve, Martine and Rich are finishing up their lunch. While the other two talk about how Cap had saved Martine's great-grandmother during World War II, Rich feels uncomfortable as they ignore him. In Vermont, the Leader and his army attack the three heroes. They are quickly defeated when the Hulk tosses the arm of the Celestial at them. Back in Avengers mansion, Steve Rogers enjoys a good book as Martine's business card sits by his phone.